We have looked at a couple of versions of Queensland's Government House before - the current one at Paddington, and also the earlier one in George St that now sits in the grounds of the Queensland University of Technology. But the very first Government House was originally a private residence called Adelaide House, owned by a Dr Hobbs, and it sat in a prestigious position at the top of a hill between Ann St and Adelaide St. 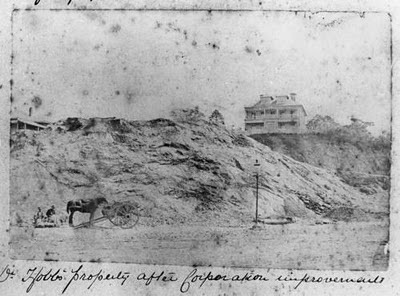 Here it is, pictured in 1882. Dr Hobbs had the residence constructed by master stone-mason Andrew Petrie in 1855. 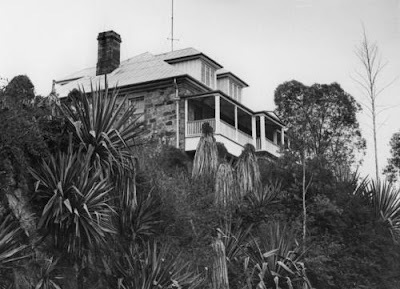 Petrie built the house using local porphyry rock from Kangaroo Point. The house became part of Queensland's history when the state's first governor arrived in 1859. As the new Government House to be built in George St was still being planned, the state leased Adelaide House from Dr Hobbs to house the governor and his family. In fact, on landing in Brisbane, Governor Sir George Bowen was transported to Adelaide House, where he was officially installed as governor and the letters patent announcing the separation from New South Wales were presented. The following photo, taken in 1971, shows the house from Adelaide St, featuring the balcony that had the starring role in the formation of the state. When the construction of Government House at the river end of George St was completed in 1862, Governor Bowen moved there; this allowed Dr Hobbs to return to his house. He decided to rename it Bowen House in honour of the governor. Dr Hobbs sold the property in 1883 to the then wealthy dentist-entrepreneur Moses Ward, who decided to call it Adelaide House once again. Ward never lived there - he preferred instead to lease the house to well-off tenants, but an unfortunate investment in an Ipswich coal mine decimated his fortune and the property was taken over by the mortgagor, the National Bank of Queensland, upon his insolvency in 1895. In 1899, the property was acquired by the Anglican Diocese of Brisbane for the new cathedral. Originally to be demolished, the house ended up being used as the residence for the deans and their families. Robin Dods was engaged to renovate the house for this purpose, and that was completed in 1910. The house is still standing in the grounds of the now-completed cathedral, but it is very difficult to see and photograph because of the terrain and the now flourishing greenery on the Adelaide St side. Here is a glimpse of a stone wall and a verandah though. There are a couple of reminders of the birth of Queensland - outside The Deanery are a sculpture and a plaque (below - click the pic to see a larger image) commemorating the event. Lot of history here that most Brisbaneites would be unaware of.